Updated May 23, 3:00 P.M. where noted below. As expected, the Faculty of Arts and Sciences (FAS) on May 6 voted overwhelmingly to adopt an undergraduate honor code, effective in the fall of 2015. The code resulted from four years of work by the faculty’s committee on academic integrity—a period that was punctuated in the 2012-2013 school year by the investigation of the largest recent case of suspected misconduct on an examination, and the punishment of dozens of students. Although passage of the code was never in doubt, the arguments advanced for and against adoption during the May 6 debate are revealing. This account covers the legislation, the language of the code, the student-faculty board that will hear cases of alleged misconduct, and the debate itself. a. Members of the Harvard College community commit themselves to producing academic work with integrity—that is, work that adheres to the scholarly and intellectual standards of accurate attribution of sources, appropriate collection and use of data, and transparent acknowledgment of the contribution of others to our ideas, discoveries, interpretations, and conclusions. Cheating on exams or problem sets, plagiarizing or misrepresenting the ideas or language of someone else as one’s own, falsifying data, or any other instance of academic dishonesty violates the standards of our community, as well as the standards of the wider world of learning and affairs. b. 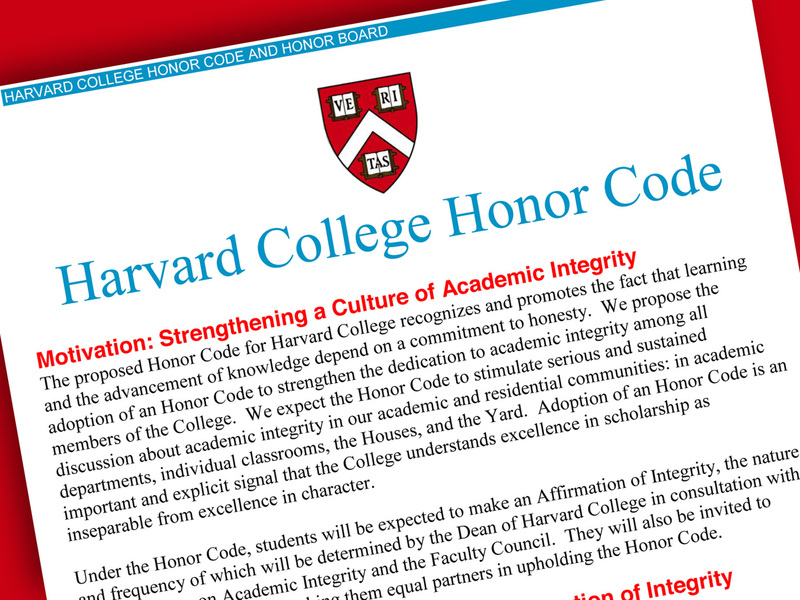 Commitment to the honor code will be demonstrated through an “Affirmation of Integrity.” The Dean of Harvard College will bring to Faculty Council a recommendation regarding the nature and frequency of this affirmation, and subsequently the full Faculty will consider it for inclusion in the Harvard College Handbook for Students. 2. Harvard College create an Honor Board to adjudicate cases of violations of the undergraduate honor code. a. The membership of the Harvard College Honor Board shall consist of Harvard College students, resident deans, other faculty, administrators, and graduate students. The Dean of Harvard College (or his or her designee) shall serve as Chair of the Honor Board. b. The Harvard College Honor Board shall have primary responsibility for all cases involving violations of the honor code and the Faculty’s rules on “Academic Dishonesty” as defined in the Harvard College Handbook for Students. i. The Administrative Board of Harvard College shall continue to review all matters that currently fall within its purview, except those directly related to questions of academic integrity. 1. In the event of questions of jurisdiction between the Honor Board and the Administrative Board, the Dean of Harvard College shall determine the appropriate jurisdiction. 2. The Administrative Board and the Honor Board shall complement each other and, as determined by the Dean of Harvard College, shall consult regularly. c. The Dean of Harvard College shall review the practices and procedures of the Honor Board on a regular basis and report any proposed changes to the Faculty. Harvard College is an academic and residential community devoted to learning and the creation of knowledge. We—the academic community of Harvard College, including the faculty and students—view integrity as the basis for intellectual discovery, artistic creation, independent scholarship, and meaningful collaboration. We thus hold honesty—in the representation of our work and in our interactions with teachers, advisers, peers, and students—as the foundation of our community. I attest to the honesty of my academic work and affirm that it conforms to the standards of the Harvard College Honor Code. Community governance. Community governance requires faculty, students, and staff to share collective responsibility for upholding the Honor Code, and we believe that the members of the community are in the best position to determine and evaluate cases of academic integrity violations. Community governance also ensures that the Honor Board represents the breadth of the Harvard College community. Education. We are committed to an educational approach to academic integrity and a Board that makes decisions through a holistic assessment of the student’s life and experiences. The purpose of the Board is to allow each individual student to learn from her/his mistakes while also affirming community members’ commitment to academic integrity. Re-generation. We recognize that an institution’s values can shift and institutions keep their values alive when each generation of the community reexamines, rediscovers, and renews these values. The principles and structure of the Honor Board will be regularly reviewed as directed by the Dean of Harvard College. Dean Harris summarized the rationale for the code and board, as evolved by the academic-integrity committee—primarily for their perceived role in strengthening community dedication to that foundational value. The committee’s work was originally motivated by concern that students were cutting corners (and doing it more easily, in an age of Internet-enabled search, cut-and-paste word processing, and so on). By making expectations about academic integrity explicit, the committee felt, the code would enhance Harvard’s culture of integrity, encouraging conversations about conduct: at the beginning of courses, when faculty members explained to students their policies on collaborative study and projects; in departmental orientation and training sessions for new colleagues; and so on. The committee’s research suggested that in institutions with such codes, and with student engagement in hearing cases of possible misconduct, such violations of academic integrity were reduced (but not eliminated). I used to be skeptical about Harvard adopting an honor code: I thought our students should know how to behave. But after being on the academic integrity committee for two years I am entirely persuaded that honor codes not only contribute to deterring cheating in the short term, but also promote a sense of confidence in the community as a whole. A vital answer is “moral reminders.” Of the many relevant experiments I particularly enjoy one of Dan Ariely’s. Ariely studied MIT and Yale students carrying out a task for which he was able to assess how much the participants cheated. He asked half of them to sign the following statement: “I understand that this experiment falls under the guidelines of the MIT (or Yale) Honor Code.” It turned out that those who signed this statement cheated less than those who did not. The splendid feature of this particular study was that neither MIT nor Yale, as you probably know, had an Honor Code at all! But that little detail did not matter. Just being prompted to think about honor makes people more honorable. I find this a very encouraging conclusion. For 18 years I knew students only through my department. For the past six years I have been a House master of Currier House and come to know more about students in the rest of their lives. Being a housemaster has made me a great admirer of the admissions committee, because I see close-up how (on the whole) our students are outstandingly moral, community-minded, thoroughly decent people. But many experience tremendous pressures of time, competition and other stressors. Like any of us, they face temptation. As an evolutionary biologist, I know that deception is not unique to humans. The more intelligent a species, the more deception it shows. The same appears to be true of individual humans. If we want to bolster our students’ best moral intuitions, as we surely do, we should adopt an honor code. I believe we should do so for a second reason also. Many House conversations have emphasized to me that when students who are persistently honest see others cheating on academic work, or skirting their professional obligations, or otherwise free-riding on the community, they are, not surprisingly, offended. The fact that someone might say “Well, everyone in my high school did it” does not matter. Like anyone else, students want their community to be trustworthy. So, to avoid misunderstandings and false assumptions, and more importantly to promote the sense of well-being where people and ideas thrive, we should make our expectations of morally appropriate behavior extremely clear—for the benefit both of our students and of ourselves as faculty. An honor code can only help in that endeavor. And several speakers identified the code as an element, but not the only element, in a larger, community-wide, commitment to academic integrity—with clear expectations for faculty members’ demonstrable devotion to thoughtful teaching, prompt and meaningful reactions to students’ work, and participation in their learning. UPDATED MAY 23, 3:00 P.M. with inclusion of remarks from Professor of philosophy Edward j. (Ned) hall, following. It matters that there be places in our society where the collective enterprise of building and sustaining knowledge and understanding—of our world, and of our place in that world—can flourish freely, as undistorted as possible by the powerful but momentary currents that run through the politics and culture of our day. It matters a very great deal. We all know this. We wouldn't be here, otherwise. And when we speak together of "academic integrity," we are speaking of the integrity of this very collective enterprise. So if an honor code has genuine value—as I think it does—it is because of the way it will help secure that integrity. Not by providing us with more effective mechanisms for rooting out misconduct; that is the creepy, Orwellian reason for having such a code, and it is a reason we should forthrightly denounce. Rather, what we should hope is that this code will play a role in helping our students—who are, as a rule, profoundly decent and humane—come to a joint and common understanding and endorsement of the value of our collective enterprise. That should be its purpose. And so this cannot just be about our students. For our community as a whole very much needs to come to such a common and joint understanding—and the evidence of this need, on our side, is all too easy to point out (and doesn't have anything to do with cheating; that is much too narrow an understanding of the issues). We have a culture that permits rampant grade inflation. We have a system of TF [teaching fellow] allocation that is so broken, and leaves our graduate students so anxious and uncertain about their employment, that departments feel compelled to enter into a zero-sum game in which the aim of giving our undergraduates serious, challenging, transformative courses gives way to the need to have high enrollments. Our policies concerning "simultaneous enrollment" [allowing students to take for credit classes scheduled to meet at the same time; a policy now under review] inadvertently but unambiguously send the message to our students that face-to-face contact with us isn't really that important. We view teaching as, in the words of one of my colleagues, the "second most private act"—and in so doing squander opportunity after opportunity to teach each other how to do it well. And so on. Daunting problems. But there are plenty of grounds for optimism—at least, if we seize this moment in the right way. As part of my work on gen ed, I have had, along with [Associate Dean of Undergraduate Education and administrative director of the program in General Education Stephanie H.] Kenen, dozens upon dozens of conversations with colleagues across the University both about the program and about broader pedagogical issues. Here is the key point that these conversations have made perfectly clear: The vast majority of us in the faculty and administration are fundamentally—fiercely—committed to the ideals of our institution. There lives, widespread among us, a powerful and deeply inspiring vision of what we can accomplish for our students. All that is needed, in order for us to deal effectively with our own issues of "academic integrity", is that this should become a common vision, one that we can act on in concert. We should take this moment to begin to bring about such a common vision. Several criticisms of the legislation were vividly expressed. Among the most salient were arguments about might be called the appropriateness, efficacy, and symmetry of an honor code. First let me say that I am opposed to neither integrity nor honor. Strongly in favor of both! In fact I am glad that these words are re-entering our vocabulary. I just haven’t heard the evidence that the device that is being proposed here gets at the problems we have, or that we even understand what those problems are. We should be talking about the incentives and rewards we present to our students, and to which they respond, sometimes badly. Some introspection on faculty culture would be healthy, too, because students take their cues from us. But all that will have to be for another day; I want to speak to the motion as it is before us. Do we know better now? Equipped with psychological research, perhaps we have discovered that oaths really do have the “power to bind conscience.” So it would seem…. In today’s world, pledges and oaths are for scout troops and fraternities and military schools, places where the high values are obedience and regimentation. Actually I once received a delegation from one of the service academies when they were trying to figure out what to do about a cheating scandal of their own. Pledges don’t belong in academic communities like this one, which at its best is a place of mature, free-thinking, skeptical, nonconforming men and women. Please excuse me for characterizing this exercise as juvenile, but we know that it is. No one would propose that members of this faculty make such an affirmation. Many of us would refuse to take it. We value academic integrity even more for ourselves than we do for our students. But for all the talk about shared student and faculty buy-in, voting this would be to go on the record as believing that a ritual affirmation of integrity is good for students, even though we would not be willing to take it ourselves. For the past seven years, I've taught CS50, our introduction to Computer Science, and as a result I've spent quite a bit of time each year reflecting on today's topic. We, CS50, have long had the unfortunate distinction of referring, to my knowledge, more students to the Administrative Board for reasons of academic dishonesty than any other course, [the] recent exception aside. I do not believe students behave any less honestly in CS50 than in other courses, but…we look for transgressions and, as a computer-science course with electronic submissions, it is easier for us to detect them. I should also emphasize that while we do use tools for detection, it is ultimately human eyes that decide, my own specifically, whether or not some line has been crossed. Our own numbers are highly variant, but each fall we Ad Board as many as 5 percent of CS50's several hundred students. In 2011, for instance, we Ad Boarded 33 students; in 2012, we Ad Boarded 11; and in 2013, we Ad Boarded 20, despite what I'd hoped would be a sensitization to the issue across campus. Most of our cases are the result of one student having copied another student's programming assignment, either from the same year or some prior year, thereafter submitting it as his or her own, sometimes with minor changes. I'm sure sometimes the act is a late-night moment of panic and bad decision-making, and sometimes because the student simply didn't care. I say all of this because I am very skeptical that the right step toward a solution to the problem at hand is an honor code and an honor board. Indeed, I've read our literature review twice, and even it seems skeptical. Indeed, its own suggestions emphasize cultural interventions, particularly during freshman year but also beyond. I am wholeheartedly in favor of those cultural interventions, wherein we create and rely far more on teaching moments than on a code and on a board. And I will happily volunteer CS50 as a testbed for new forms of discourse on and exposure to the issue at hand. But it is the proposed affirmation of integrity that worries me more. I've been reminded of late of the year I taught public high school in between college and grad school. I was the only one in the classroom each morning not to hold a hand to the heart and recite the Pledge of Allegiance, even as all of my students did. I didn't feel that recitation of that pledge would make me any more patriotic, and I didn't want to teach my students that it would. Ultimately, then, I want to lend my wholehearted support for any and all initiatives in the coming year that emphasize cultural interventions and new social norms over new policies and structures. Indeed, I'm hopeful we can achieve the former without the latter. Symmetry. Proponents of the honor code and board said they promote community conversations and proper behavior. Some speakers in favor of the code explicitly addressed professors’ reciprocal obligations as teachers: not only to conduct their research honestly, but to fulfill their classroom and pedagogical responsibilities to students fully. One proponent in fact mentioned such problems as grade inflation; haphazard assignment of teaching fellows; permission for students to enroll in classes that meet simultaneously (thus devaluing in-person, classroom, residential education that is presumed to be central to Harvard and similar institutions); and treating teaching as a “private act” (and therefore not subject to review and improvement) as evidence of shortcomings on faculty members’ side of the equation. But critics note that the honor code and board pertain to and explicitly govern students, not their teachers. Lewis noted, in his argument about making oaths or affirmations, that the faculty would not be asked to do so (although FAS dean Michael D. Smith said that as an individual, he would be happy to make such an affirmation—a different point from asking the faculty members as a whole to do so). Those matters remain on the record, but did not sway the vote, by a nearly unanimous show of hands, to adopt the legislation and move forward with Harvard College’s new honor code and honor board as at least a formal element of the institution’s response to the perceived challenges of raising awareness of and fostering academic integrity among undergraduates today.